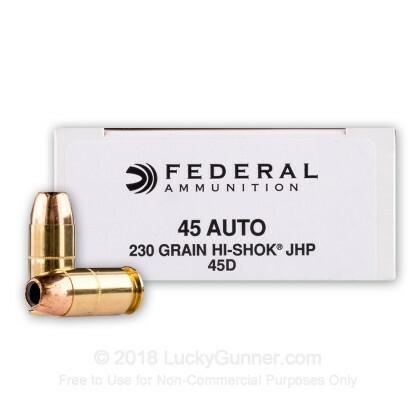 This hard to find 45 ACP Federal Classic Hi-Shok JHP ammo is a great load for your personal defense needs. This hard hitting jacketed hollow point bullet is designed to expand upon impact for maximum stopping power. The Federal Hishok from lucky gunner was a great value, just a little higher than ball ammo locally but with self defence quality. Shoots accurately and soft on recoil. Love this stuff. New shooter with better ammo. I have been working with the new shooter with a new Springfield 1911 Loaded. She had been shooting ball ammo and I decided to move up to more than practice ammo. When shooting she told me she could feel the difference, more ft per sec. The scores she shot for close distance showed improvement. We are working on strength in hands and pulling the slide fully to the rear. She will shoot more of this ammo this week at training. You cannot beat the price for the quality! Very solid ammo. Shot 50 rounds through my Kimber and was pleased. Will definitely be purchasing more! Great product for the cost! I've never had a problem with this round. 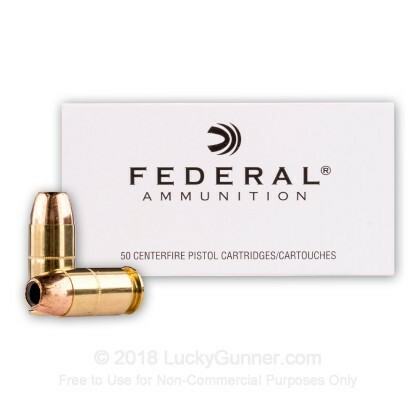 In my experience, Federal also burns cleaner than most other, higher priced ammo. Lucky Gunner is a fast and clean 'straight shooter' when it comes to doing business. Every time it seems. I won't buy from anyone else anymore. That says a lot. Still the best in my opinion! My Go To 45 Ammo for any/all Firearms! UPDATE: THIS STUFF IS AWESOME! I CAN'T FIND ANYTHING BETTER OR MORE RELIABLE IN ANY WAY. I WENT TO THE RANGE A FEW DAYS AGO FOR SOME ROUTINE PRACTICE AND SHOOTING THIS FROM MY GLOCK 21 (Also use in Glock 30) WAS GREAT, RELIABLE AND GOOD GROUPS/ACCURACY. I was also shooting my Taurus TCP .380 Micro Compact Pistol, Glock 19 9mm and Smith & Wesson M&P 9mm and i honestly can't tell much difference between the recoil of the 9mm Handguns and this Federal Hi Shok 230 Grain .45 ACP out of my other guns, I know the recoil should be noticably less in the 9mm Handguns but to me it's hard to distinguish the difference. I'm a big Glock Fan and have been used to shooting .45 ACP Since I bought my first handgun as soon as i was legal to over 10 years so maybe im just used to the recoil, maybe being 6'3" Tall and 240 Pounds helps absorb recoil as well but i simply can't say enough good stuff about this ammo. As a side note: the little Taurus TCP/PT-738 .380 performed flawlessly with about 7 different brands of mixed FMJ and mostly JHP Ammo and the gun was incredibly accurate with very tight groups shooting the exact same kind of ammo- the Federal Hi Shok 95 Grain JHP's and of course that's what will be carried in it. I just can't say enough good stuff about this ammo and it's honestly awesome in all calibers from my experience. As another side note, the Taurus TCP .380 was initially a great pistol but developed a few issues with reliably, especially with double feeds and failures to extract BUT AFTER A FREE TRIP BACK TO TAURUS THANKS TO THEIR LIFETIME WARRANTY IT'S NOW BETTER THAN EVER, I SHOT IT SO MUCH TRYING TO FIND A FLAW BUT SINCE THEY UPDATED THE BARREL/FEED RAMP DESIGN, EXTRACTOR, AND MAGAZINE SPRING IT EATS ANYTHING AND I WOULD TRUST IT JUST AS MUCH AS MY TRUSTY GLOCK, Kimber, XD, M&P or anything else for daily carry purposes. If you want to buy one just make sure it's a newer model with the improved feed ramp design, etc and you should be good to go. BOTTOM LINE: THIS AMMO IS AWESOME IN EVERYTHING I PUT IT IN FROM THE LITTLE .380 TO THE MUCH LARGER .45 ACP. 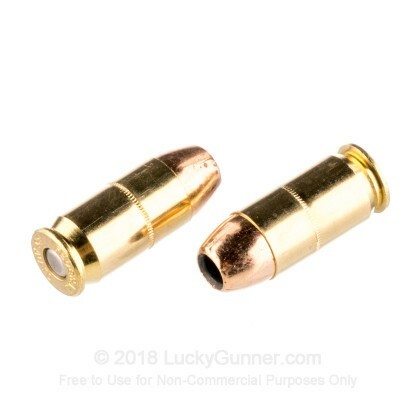 PLUS AFTER WATCHING TESTS ON YOUTUBE THIS TYPE OF AMMO FOR THE .380 OUTPERFORMED EVERYTHING ELSE INCLUDING SPEER GOLD DOT, COR-BON, DOUBLE TAP, BUFFALO BORE, AND ABOUT 10 OTHERS, I HIGHLY RECOMMEND IT AND ENCOURAGE ANYONE NOT TO HESITATE TO BUY IT. I KNOW THIS IS A LONG REVIEW BUT I'M JUST TRYING TO BE AS THOROUGH AND GIVE AS MUCH ADVICE AS POSSIBLE. I WISH I COULD GET A JOB REVIEWING AMMUNITION AND HANDGUNS, RIFLES, ACCESSORIES, AND WRITE REVIEWS FOR A LIVING. **** IF YOU WANT TO TAKE A CHANCE ON A YOUNG MAN THAT WILL WORK HARD AND NOT DISAPPOINT IN ANY WAY PLEASE CONTACT ME, I'M EDUCATED WITH EXPERIENCE IN THE BUSINESS WORLD AND AN AVID FIREARMS ENTHUSIAST, IM READY TO GO ANYWHERE, ANYTIME!!!!! Come on Lucky Gunner, you guys won't find anyone that works harder and is as passionate as me!!! Excelent ammo, accurate, and a good price. Great ammo for the price. Shot 1/2 and stored the other. This is a real knock-down round, but I am still torn between the HP and FMJ in this caliber and bullet weight. Unless the HP ammo is hypersonic, it does not always deform to specification. But, when you get hit with 230 grains at under 50, what's the difference, because somebody's not walking away! Fired 200 rounds thru my new Colt 45. Clean and accurate. Good ammo. Can't beat the price for JHP, and it worked great in my 1911! either you own this ammo or you wish you did. difficult to find in stores,is a proven man stopper,works on large game if needed. when you are offered such ammo,buy it. increases the lethal performance of your handgun. ever need it you will have no regrets,isn't that what we all seek,no regrets. FIred an entire box (50 rds), Performed as expected with not one misfire or jam. Good stuff! Great round,good price,fast delivery.very satisfied. I FEEL IT IS EXELENT PDA AND I KNOW THERE ARE SOME THAT ARE BETTER BUT IF YOU HIT HIM RITE ANYTHING WILL DO . As a Vietnam combat veteran the used my issued .45 govt issue in combat I wish I had had these rounds then but the 1911 did a great job then and now. A Good product at a fair price, Lucky Gunner has my business. One day delivery. You can't beat that service. Bravo, Lucky Gunner, I'll be doing business with you again soon. As for the ammo, I haven't fired it yet. But I do know there are better defense rounds out there based on the ballistic gel tests that I've seen on this ammo. Thanks for great customer service and the real-time ammo tracking. Great rounds! Will purchase again! Best protection round for my G21...smooth as silk. Shame its discontinued...stock up on it while you can. First time to shoot JHPs through my Colt Officer and Sig 1911. No failure to feeds, no failure to eject and perfect grouping. Will not have to try anything else! Great Round and Equally Great Service-LUCKY GUNNER HAS MADE A LIFELONG CUSTOMER OUT OF ME! !!! I bought a case of 1000 of these and a1000 round case of the Blazer 230 Grain .45 ACP rounds as 2 seperate orders and both were in my possession in 2 business day-best service ever!!! Both rounds work accurately and flawlessly in my Kimber Ultra Crimson Carry 2 and they will also be used with my Glock .45 ACP Pistol. I'll be using them in a Glock 30 as well. I consolidated my handguns down to what I needed and I think the Kimber UC2 is perfect for daily concealed carry, the G21 is a perfect full size pistol and the Glock 30 is a perfect backup gun to carry with the G21 because of its smaller sub-compact size (but not as small and easy to carry/conceal as the Kimber UC 2) and if the ***t hits the fan the larger Glock 21 magazines fit smaller Glock 30 frame- you gotta love the interchangeably of the Glock magazines! And I love the fact that all 3 great pistols shoot the same tried and true, reliable and hard hitting .45 ACP Round and I've only got to worry about keeping one round in stock instead of having to keep up with 9mm, .40, .357. and .45 like I used to, it just makes more sense as far as convenience and economic reasons especially with bullet shortages such as they are anymore. I know 9mn and .40 are great rounds and cheaper traditionally but they're not really that much cheaper anymore but the popularity of those rounds makes them even harder to find these days but Lucky Gunner seems to always have the trusted .45 ACP in stock. I mean no disrespect to the 9mm and .40 S&W as I've owned then both numerous times over but for now I'll stick with the good old .45 ACP, IF AMMO PRICES AND AVAILABILITY EVER GET BACK TO WHERE THEY WERE A SHORT WHILE BACK I MAY ADD A FEW 9's AND .40's BACK TO MY HANDGUN COLLECTION. THESE ARE JUST MY PERSONAL OPINIONS SO PLEASE DON'T BE OFFENDED GUYS. GOD BLESS AND MAY HE KEEP US SAFE AND KEEP US FROM HAVING TO PUT OUR ARSENALS TO USE. 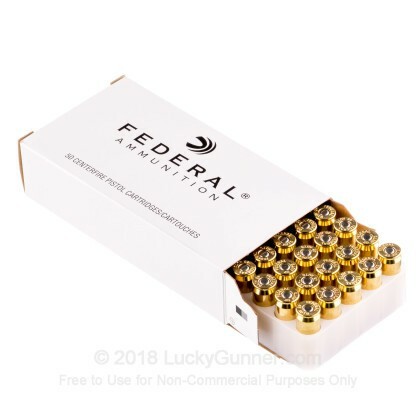 This 230gr version of Federal Classic Hi-Shok is excellent ammo. I gave it a try awhile back side by side with top shelf 45ACP like Ranger-T, Golden Saber, HST and it more than held its own. Smooth recoil and consistent grouping. It's a keeper. Perfect and flawless as usual. Hope LG will hang in there during these trying times. I started carrying this round in some of my everyday mags and feel very secure with them. They're positive functioning and are surprisingly accurate in my Springfield Mil-Spec 1911Stainless! I like the 50 rds per box also. I see no difference in actual performance vs the HST-.45ACP rd. This ammo worked flawlessly at the range in my Sig 1911 and Kahr PM45. Have it stacked in the Kahr for everyday carry, but won't really know if it gets the job done unless the time comes, though. 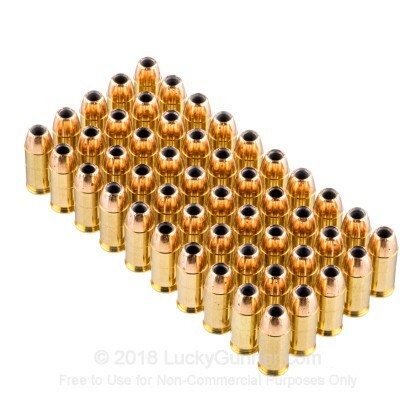 I shot a box of these Hi-shok rounds today without a single issue, I had read a review of a guy with a Rock Island 1911 jamming up constantly with these but not mine. Every round does serious damage to the target, looks huge next to a 9mm hole. Would recommend & I want to get more soon. 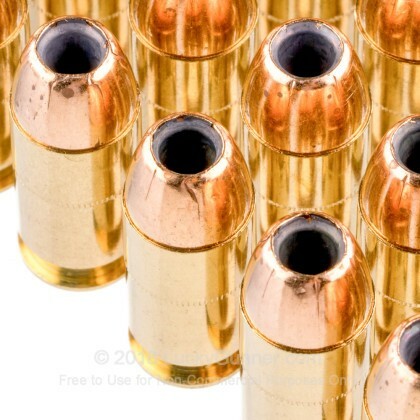 This is Federal ammo, what more can I say. Great bullet, does big damage. Great quality, and just one box will last you a long time. Better get out of the way of this one! My Kimber Ultra TLE and Kimber Pro Raptor ate this stuff up - great price - reliable no issues with it at all. Thanks LG fast deliver and great service as usual! These JHP's feed perfectly in all my Colts, penetrate pretty well for a .45 and do massive amounts of damage. Good home defense round. Fired several into a wood block and they came out looking knarly. I know that's not a ballistics gel report but my FNP45 shot them without any failure and it just annihilated the wood block and tore it to pieces. No problems with rapid fire either. Great value also. You can purchase on box and have enough to load several mags. These Federal .45 auto rounds are positive functioning and perform flawlessly in my Springfield Armory Mil-Spec Stainless. I particularly like the 50 round packaging as it allows you to fire a few and have the remainder on hand. Q: I have been wondering about this for a while and seek some expert advice- my question is about magazine/clip storage. Here goes: Is it bad to keep my extra magazines loaded to full capacity? For example: I keep my Glock 21 Magazines fully loaded with 13 rounds of Federal 230 Grain HI-SHOK in them at all times. I also keep my Kimber compact 1911 Ultra Crimson Carry's Kimber Pro Tac Mags and my Wilson Combat 1911 Magazines for the same Kimber loaded to full capacity at all times. I feel like it should be fine to keep them loaded up and ready to go in case I were to ever need to use them I know they are ready to go. After all the magazines for the Glock cost $40+ each and the Kimber's compact 1911 magazines were $30+ each- I would think this would be ok because they are some of the best quality magazines money can buy and they should be able to handle being loaded considering that is their purpose and I would hate to be caught off guard in a life or death situation trying to load magazines in the dark or while being shot at, God Forbid. Q: I just bought a s w govoner. what do you think is the better round for personal defense ..410 shot shell, 45 long colt or the 45 acp and what brand is the best. A: While it mostly depends on what the shooter is comfortable with using, and the defense application, either the 410 or Long Colt in a jacketed hollow point is preferred. The 45 ACP round will only chamber in a semi auto pistol, unless modifications are done to the revolver, such as a moon clip. This is usually not desired as accuracy and performance will be reduced as the revolver has been designed for a different caliber.